Each district court has specific local rules that may apply in your case. Check with the clerk of the district court in your county. If you fail to follow the local rules, you may not be able to finish your case. 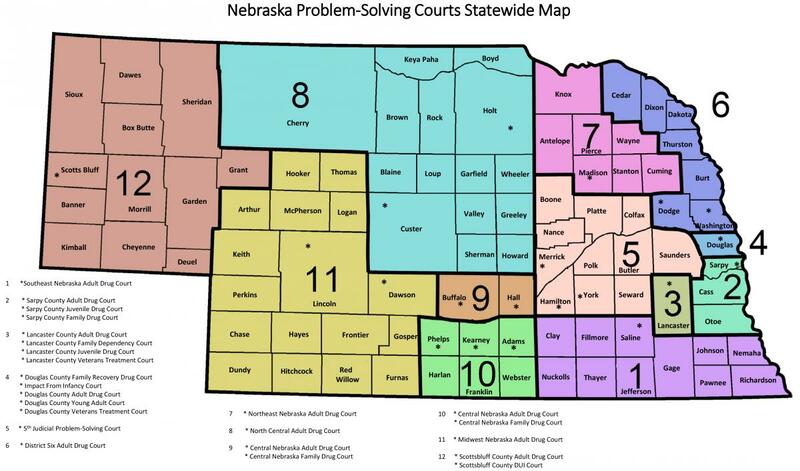 Automated Forms through Legal Aid of Nebraska: Users of this website are welcome to use the free automated question/answer forms through Legal Aid. Click: Family Law Self-Help Forms. A divorce can be complicated, and disputes over children and property make them even more complicated. Representing yourself in such cases may not be appropriate or wise. Although it is up to you to decide whether and how you use a lawyer in your divorce, the law does allow you to do your divorce by yourself, known as proceeding pro se (pronounced "pro-say"). Another option is to hire a lawyer to do only part of your divorce. This is called Limited Scope Representation. There is no real property (real estate), nor an ongoing business being operated by one of the parties, and all other property has or can be divided without argument. The parties are fully aware of all debts incurred during the marriage and have or will be able to agree on who will pay each debt. Neither party has a pension or retirement plan with his or her present employer, or from a past employer. No alimony will be requested by either party. NOTE: UNLESS YOU MEET ALL OF THESE REQUIREMENTS YOU SHOULD NOT ATTEMPT TO DO YOUR OWN DIVORCE USING THESE FORMS AND INSTRUCTIONS, AND YOU SHOULD NOT PROCEED WITHOUT THE HELP OF A LAWYER. You or your spouse must be a resident of Nebraska for at least one (1) year before filing your divorce with the court. The one exception is when you were married in Nebraska, have been married less than one (1) year, and have lived in Nebraska the entire time since your marriage. You start the legal process by filing a Complaint for Dissolution with the clerk of the district court in the county where you or your spouse lives. There is a cost to file a Complaint for Dissolution. Once you file, you will be given a case number for your case. This number must be on all documents you file with the court in the future. If one or both individuals changed their name and wants to have their former name restored, they must individually ask the court to restore their former name using the Complaint for Dissolution (if plaintiff) or the Answer and Counterclaim (if defendant). If you are filing for a divorce without a lawyer, you must complete all the necessary forms. The clerk of the district court cannot help you prepare any legal documents and can provide only limited information about the process. Once you have filed your Complaint for Dissolution, it is important that you inform the clerk of the district court if your or your spouse’s address changes. Complete list of forms and instructions. What must you take to the clerk of the district court to file a divorce? Complaint for Dissolution of Marriage(DC 6:4(1)) -- This is the first document you must give to the clerk of the district court. When you file this document, you begin the process of getting a divorce. However, filing the Complaint is only the beginning of the process – you will not be divorced until the judge signs a Decree of Dissolution of Marriage and the Decree is filed with the clerk of the district court. Please refer to the Instructions for Completing the Complaint (DC 6:4(1a)) for details on how to fill out the Complaint. Filing fee or filing fee waiver papers -- In order to file the Complaint with the clerk of the district court, you will need to pay the filing fee. If you cannot afford to pay the filing fee because you have a very low income, you can ask the judge to waive the filing fee. See "Proceeding Without Payment of Fees," which has forms and instructions to help you ask the judge to waive the filing fee. Confidential Employment and Health Insurance Information and Social Security Information forms -- These documents must be given to the clerk of the district court at the time of filing your Complaint. What Happens Once the Forms are Filed? Once you (1) file the Complaint, (2) file the Vital Statistics Certificate, (3) give the Confidential Party Information and Social Security Information forms to the clerk of the district court, and (4) either pay the filing fee or have the filing fee waived by the judge, the clerk will create a file on your divorce case. The clerk will give your file a case number and will know the name of the judge who will hear your divorce case. If you need the name of the judge, please contact the clerk’s office for that information. NOTE: YOU MUST SERVE YOUR SPOUSE (OR FILE A VOLUNTARY APPEARANCE SIGNED BY YOUR SPOUSE) WITHIN SIX (6) MONTHS OF WHEN YOU FILE YOUR COMPLAINT FOR DIVORCE. IF YOU DO NOT SERVE YOUR SPOUSE OR FILE A VOLUNTARY APPEARANCE SIGNED BY YOUR SPOUSE WITHIN SIX (6) MONTHS OF THE TIME YOU FILE YOUR COMPLAINT FOR DIVORCE, YOUR CASE WILL AUTOMATICALLY BE DISMISSED. You can give notice to your spouse in one of the following ways: Voluntary Appearance, Praecipe for Summons, or Service by Publication. Each method is discussed in more detail below. Usually, it is best to try the Voluntary Appearance first. If that does not work, then try the Praecipe for Summons. If that does not work, then try Service by Publication. If you serve your spouse by publication, the court will be able to give you a divorce, but may not be able to do much more than that. Voluntary Appearance (DC 6:4(3)) -- Your spouse can accept service by signing a Voluntary Appearance. Here is what to do. Follow these Instructions for Completing the Voluntary Appearance (DC 6:4(3a)). Give your spouse the Voluntary Appearance form and a copy of the Complaint. File the signed Voluntary Appearance form with the clerk of the district court, unless your spouse has already done so. Praecipe for Summons (DC 6:4(4)) -- You can have your spouse served by the sheriff. When you live in the same county as your spouse, here is how you do it. Follow these Instructions for Completing the Praecipe for Summons (DC 6:4(4A)) (pronounced "pray-si-pee") . File the Praecipe for Summons with the clerk of the district court where you filed your divorce. Call the clerk or local sheriff to find out how much it costs to have the sheriff serve your spouse. Take a money order for this amount made out to the sheriff with you when you file the Praecipe. The clerk will write up a Summons. Then the clerk will send the Summons, Complaint and money order to the sheriff. The sheriff will try to serve your spouse with the Summons and Complaint. This is an example where each district court may have specific local rules. Check with the clerk of the district court in the county you filed in to be sure this is the way your county gives the Summons to the sheriff. The Summons tells your spouse that you have filed the Complaint and when your spouse must file an Answer. If the judge granted your Application to Proceed In Forma Pauperis, attach a copy of that Order to the Praecipe. You should list all addresses in the Praecipe where the sheriff might be able to find your spouse, including your spouse’s home and/or work addresses. If your spouse is usually at a location during certain hours, you can list that in the Praecipe. Does it make a difference if my spouse and I live in different counties? Pick up the Summons from the clerk once it is ready. Ask the clerk when you file the Praecipe how long it will take to prepare the Summons and how to find out when it is ready. Call the sheriff's office for the county where your spouse lives. Find out how much it costs to serve the Summons. Find out how to pay the sheriff for serving the Summons. The sheriff will want payment in advance. If the court approved the Application to Proceed in Forma Pauperis, ask the sheriff's office if they will serve the papers without payment in advance. You will mail the Summons and a copy of the complaint to the sheriff for the county where your spouse lives. Include a letter explaining to the sheriff that the Summons and a copy of the Complaint must be personally served on your spouse before the "return date" on the Summons. The sheriff will try to serve your spouse. The sheriff will return documents to you with a "return of service." The return of service will state whether your spouse was served. You must file this paperwork with the court, even if your spouse was not served. If you cannot get your spouse to sign a Voluntary Appearance and if the sheriff is unable to serve a Summons on your spouse, you can ask the court for permission to serve your spouse with notice of the divorce in another way, referred to as Service by Publication. Your spouse is considered the defendant in the divorce case if you filed the Complaint. Your spouse has 30 days after being served to file a written response to your Complaint with the court. (If your spouse signed a Voluntary Appearance, the 30 days begin to run the day after you file the Voluntary Appearance with the court.) Your spouse does not have to file papers responding to your Complaint, but is entitled to do so if your spouse wants to. If your spouse would like his/her former name restored, he or she should file the Answer and Counterclaim found below. You cannot ask the court to hear your divorce case until at least 60 days have passed from the time your spouse was served. (A) If the sheriff served your spouse in person, the 60 days begin to run the day after the sheriff served your spouse. (B) If you filed a Voluntary Appearance signed by your spouse, the 60 days begin to run the day after you file the Voluntary Appearance with the court. (C) If you served your spouse by publication, the 60 days begin to run the day after the last date the Notice of Divorce Proceeding was published in the newspaper. If you are the defendant in this divorce you can file an Answer and Counterclaim for Dissolution of Marriage. Prepare the Answer and Counterclaim for Dissolution of Marriage (DC 9:1) using the Instructions for Completing the Answer and Counterclaim for Dissolution of Marriage (DC 9:1(a)). Name restoration: Use this form to request that the judge restore your former name to you and to express yourself directly to the court. After you have signed the original Answer and Counterclaim for Dissolution of Marriage you must file it with the clerk. Make sure to fill out the information requested in the Certificate of Service at the bottom of the last page of the Answer and Counterclaim and sign the Certificate of Service before you file the original Answer and Counterclaim with the clerk of the district court. Make two copies of the Answer and Counterclaim for Dissolution of Marriage after you have signed it but before you file it with the court. Send one of those copies to your spouse by first-class mail, and keep the other copy for your files. You must contact the clerk of the district court to ask how to get a hearing date and time in your divorce case, since different courts have different procedures. A. Notice of hearing to your spouse. You must sign the original Notice of Hearing and file it with the clerk of the district court. Make sure to fill out the information requested in the Certificate of Service at the bottom of the Notice of Hearing. If your spouse was served by publication, you do not need to prepare and file a Notice of Hearing. Sign the Notice and the Certificate of Service before you file the original Notice of Hearing with the clerk of the district court. Make two copies of the Notice of Hearing after you have signed it but before you file it with the court. Send one of those copies to your spouse by first-class mail to the address where they were served, unless that address is not their home address. If that address is not their home address, or you know that they have moved, send the Notice of Hearing to their current home address. Keep the other copy for your files. Make certain to check with the clerk about how far ahead of the hearing date you need to file the Notice of Hearing with the clerk’s office. Prepare a Decree of Dissolution of Marriage (DC 6:4(6)) using the Instructions For Completing the Decree of Dissolution of Marriage (DC 6:4(6a)). If you served your spouse by publication, use the Decree of Dissolution of Marriage – Service by Publication (DC 6:6(6)) and the Instructions for Completing the Decree of Dissolution of Marriage -- Service by Publication (DC 6:6(6a)). You will take this Decree to the hearing to give to the judge. Prepare what you are going to say in court. A sample of what you might say in court is included in the list of forms and is entitled "Instructions for your Divorce Hearing (DC 6:4)." If service was made by publication, the "Instructions for Divorce Hearing - No Children - Service by Publication(DC 6:6A)" is a sample of what you might want to say. It’s okay to write out what you want to say ahead of time and read it when you go to court. Practice what you want to say so that you won’t be too nervous when you go to court. Arrive at your hearing at least 15 minutes before your hearing is scheduled. Once you arrive at the courtroom for your hearing, you should ask the clerk of the district court how to let the judge know that you are there for your divorce hearing. If you do not appear at the final hearing, your case may be dismissed and you will have to start over again. If you know in advance that you will be unable to appear, contact the court. You must go to the hearing and testify (talk under oath) in open court about your divorce. Once you have testified, the judge will decide if you will get a divorce and if the Decree of Dissolution that you prepared is done correctly. If the judge signs the Decree, that means that the judge has decided to grant your divorce. The judge will usually tell you the day of your hearing whether or not the Decree will be signed. If the judge signs the Decree and you want an official ("certified") copy, you should ask the clerk of the district court how to get one and what the cost will be to get one. If the judge signs the Decree and files the Decree with the clerk’s office, the divorce will not be final for 30 days. Also understand that you cannot remarry anyone anywhere in the world until at least six (6) months and one (1) day have passed from the date the Decree is signed by the judge and filed with the clerk’s office.